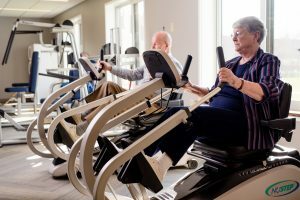 Health and wellness is a top priority of Westminster Village Muncie. 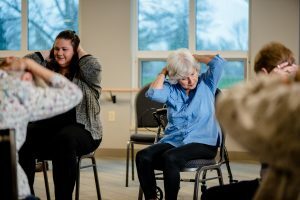 Attend the Kirkpatrick Conference on Aging and Wellness at Ball State University presented annually by the Fisher Institute for Wellness and Gerontology. Participate in daily body recall classes. Learn from experts on a variety of health and wellness topics at lecture programs in the comfort of the Main Lounge. Enjoy Heart Healthy selections at every meal in the Dining Rooms. Benefit from on-site occupational, physical or speech therapy as ordered by your private physician. Travel in comfort on the Village Bus to fitness and sports programs for seniors at Ball State University, the YMCA and area fitness clubs. Take advantage of the Fitness Center at Westminster Village Muncie. Participate two times per week with YMCA SilverSneakers in the Wellness Center.